Background Current guidelines recommend that acute exacerbations of chronic obstructive pulmonary disease (COPD) be treated with systemic corticosteroids (SCs) for seven to 14 days. Intermittent SC use is cumulatively associated with adverse effects such as osteoporosis, hyperglycaemia and muscle weakness. Shorter treatment could therefore reduce the risk of adverse effects. Objectives To compare the efficacy of short-duration (seven days or fewer) and longer-duration (more than seven days) SC treatment of acute COPD exacerbations in adults. Search strategy We searched the Cochrane Airways Group Register of Trials (to April 2011) Cochrane Central Register of Controlled Trials (to April 2011), MEDLINE (from 1950 to October 2010), EMBASE (from 1980 to October 2010) and the reference lists of articles. Selection criteria Randomised controlled trials comparing different durations of SC (seven days or fewer or more than seven days). Other interventions, e.g. bronchodilators and antibiotics, were standardised; studies in other lung diseases were excluded, unless data on participants with COPD were available. Data collection and analysis Two review authors independently extracted data that were pooled themusing ReviewManager 5.We sought missing data fromauthors of studies published as abstracts only. Main results We identified seven studies including 288 participants; two studieswere fully published and fivewere published as abstracts.We obtained data for two studies published as abstracts from authors; these two abstracts and the two full papers contributed to meta-analysis. No study specified COPD diagnostic criteria and only one specified exacerbation criteria. 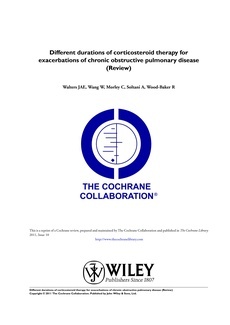 Short course treatment varied between three and seven days and longer duration 10 to 15 days, at equivalent daily doses of corticosteroids; five studies used oral prednisolone (dose 30 mg, four studies, one tapered dose) and two studies used intravenous corticosteroid treatment. Mean ages of participants ranged from 64 to 73 years.We assessed the risk of allocation and blinding bias as low for these studies. Primary outcomes: risk of treatment failure did not differ significantly by treatment duration, but the confidence interval (CI) was too wide to conclude equivalence (odds ratio (OR) 0.94, 95% CI 0.38 to 2.36) (three studies, n = 158). Forced expiratory volume in 1 second (FEV1) did not differ significantly when measured up to seven days (mean difference (MD) 0.07 L, 95% CI 0.19 to 0.05) or after seven days (MD 0.02 L, 95% CI 0.10 to 0.06) (four studies, n = 197). The likelihood of an adverse event (four studies, n = 102) did not differ significantly by treatment duration, but again the CI was wide (OR 0.58, 95% CI 0.14 to 2.40).